I’ve always been a soft touch for Piccata, traditionally made with veal cutlets and flavored with lemon, white wine and capers. I don’t eat much veal because commercial veal is a form of animal abuse. But when I can get veal from a local 4-H kid, I go for it. 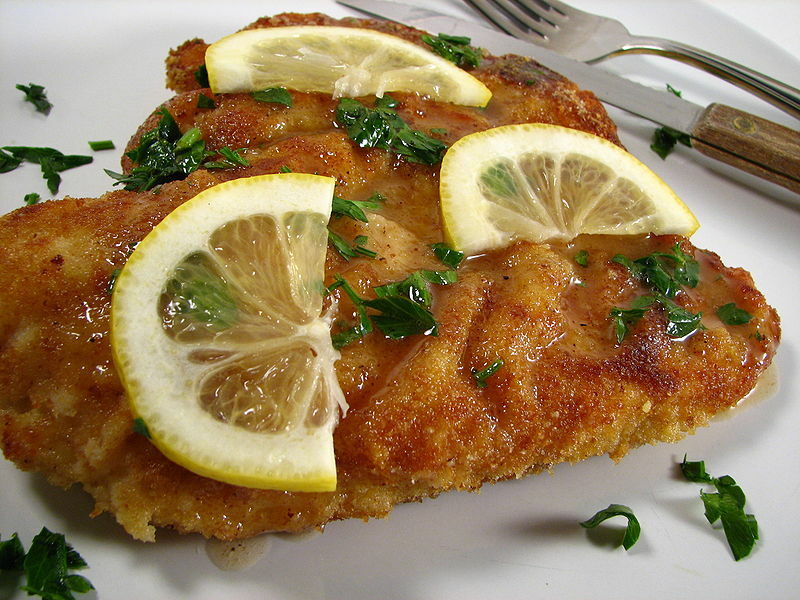 Otherwise, I make Piccata with chicken breasts, as in this recipe. Capers are a type of Mediterranean berry (Photo, left, from Wikimedia Commons). For culinary purposes they are usually fermented similar to olives, so have a similar flavor; both the buds and the berries are delicious. For the olives, I highly recommend using the brined type, rather than canned, as they have much more flavor and nutritional value. Some grocers have a brined-olive bar, with several different kinds of olives in small open crocks; you may also find brined capers there as well. Be sure to get some of the brine when you scoop out the olives, as it will keep them fresh if you don’t use them right away. This is one of my favorite quick recipes. Delicious served with bow-tie pasta. Check out a related salmon salad recipe: Salmon, Preserved Lemon and Caper Salad (2); this could also be made with the chicken cutlets. This recipe is adapted from Food & Wine, March 2007 (1), and serves 4. 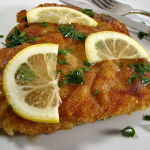 The original recipe calls for pounding the breast meat thin, but I prefer to cut the breast horizontally into ½” cutlets. You can start with skinless, boneless chicken breast meat from the store, but that chicken is likely from a CAFO (a form of animal abuse). If I have the time, I start with breasts cut from a whole chicken and brine them to help retain moisture. After brining, I remove the bones (saving them for making chicken stock at another time), but I leave the skin on because I like the flavor and nutrients it provides. Then I slice the cutlets. It is difficult here in rural Montana to find brined olives and capers. I buy canned capers (either berries or buds). I can find one type of brined olives, which is a mix of green and Kalamata Greek olives. If you use a fresh lemon, be sure to buy Organic as this recipe includes the lemon peel that would otherwise be laced with pesticides. I love this recipe best with dry vermouth added to the sauce. The spinach is an excellent accompaniment. I also prefer to add cooked bow-tie pasta and some of the cooking water during the ‘Finish’ step, and have included this in the instructions. June 2010 update: Now that I’ve learned about preserved lemons, I tried this recipe using the preserved lemon halves. I didn’t slice them, but I did roast them a bit before adding to the chicken. This was good, but I must admit I prefer the fresh, roasted lemon slices as in the original recipe. 4 ea 6-oz chicken breast halves, brined (if breasts halves are large, cut them in half again, crosswise). Prep Chicken: Brine the chicken breasts for 30 minutes. Rinse and pat dry. NOTE; If using bone-in, skin-on breasts, remove bones and skin (leave skin on if you intend to cut rather than pound into cutlets). Pound into cutlets, or cut into thick slices if the breast is large (my preference); (see Preparing Chicken Cutlets for more detail). Season with pepper, and dust with the flour, shaking off excess. Set aside. Meanwhile, prep lemons & spinach: Wash lemons, scrubbing skin, then rinse well. Cut into ¼ inch thick slices, cross-ways. Line baking sheet with parchment paper. Drizzle olive oil on the parchment; arrange lemon slices in single layer. Drizzle lightly with oil and season with salt and pepper. Pinch stems from each leaf of spinach; wash thoroughly in at least 3 changes of water; pat or spin dry. Heat oven to 375°F. Roast prepped lemon slices about 20 minutes, until they begin to brown around the edges, watching them carefully, as they burn quickly. Remove from the oven and set aside. Cook spinach: While lemons are roasting, heat dry skillet or saucier. Add spinach leaves and cook over high heat, tossing until wilted, about 2 minutes. Transfer spinach to a strainer and press out the liquid. Wipe out the skillet and heat 2 Tbsp of the olive oil. Add bread crumbs and cook over moderate heat, stirring, until toasted, 2 minutes. Add the wilted spinach, season with salt and pepper, and cook 2 minute more. Set aside. Cook chicken: In skillet (or chicken fryer for larger batches), heat ¼ cup of oil over medium-high heat. Cook dusted chicken, turning once, until golden, about 6 minutes total. Cover with splatter screen to reduce splattering. Optional: if using pasta or gnocchi, cook in boiling water according to instructions on package, but removing from cooking water before done; reserve cooking water. Finish: While chicken cooks, slice the olives and combine with capers. Add to chicken with stock and wine (if using); bring to a boil. Cook until reduced by about two-thirds, about 5 minutes. Add roasted lemons, butter and parsley; add cooked pasta (if using) and toss; add some of the reserved cooking water if mixture is too dry. Season to taste with salt & pepper; simmer just until chicken is cooked through, about 1 minute. Serve: Transfer chicken to plates and spoon sauce on top. Serve spinach on the side. Braised green beans or broccoli is a good accompaniment. 8/22/09: (Yes, it took awhile for me to get around to this one). This is excellent, as written. The lemons are a bit tart, which is a nice balance with the olives and capers. However, if you’d like them just a tad sweeter, sprinkle each slice with a few grains of sugar, or drizzle with a bit of honey or maple syrup before roasting (don’t overdo). 1/15/18: I’ve made this a zillion times, but today I didn’t have any spinach so I used lacinato kale; otherwise as written (for ¼ recipe). Kale doesn’t wilt as much as spinach, and doesn’t retain a lot of moisture so I didn’t need to squeeze out water. Made the sauce with vermouth, but used too much broth (½ cup) by mistake, so it took longer to cook down. Served with potato gnocchi. Result: Delicious as always, and I like the kale perhaps more than spinach. This entry was posted in Alcohol, Bread, Capers, Citrus, Fat or oil, Herbs, Leafy Veggie, Olives, Pasta, Poultry, Pounded, Roasted, Sauteed, Steamed, Stock, broth and tagged breadcrumbs, butter, capers, chicken, chicken stock, gnocchi, lemon, olives, parsley, pasta, spinach, vermouth. Bookmark the permalink.